Books! We love all them, right? You probably wouldn’t be following this blog if you weren’t a self-proclaimed bookaholic. For as long as I can remember, losing myself in a book has always been my favorite way to spend snippets of free time. 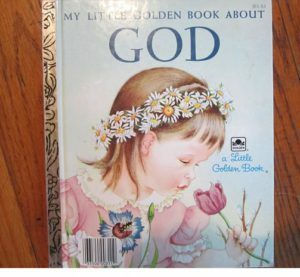 As a child, the Little Golden Books were some of my favorites to read. Do you remember this one? I recall spending hours looking at the illustrations. Once I learned to read, I devoured it repeatedly. Fast-forward several years and a vivid memory pops to mind. It was the first time I purchased a book using my allowance. I was eight-years-old and after having dinner out, my parents took me and my sister to the bookstore. The evening was cold and rainy, but I didn’t care. I had money burning a hole in my pocket and I planned to spend every penny on my favorite thing…books. 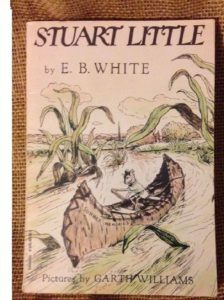 Leaving the store, I had a little change in my pocket and Stuart Little in my shopping bag. When I was old enough to obtain a library card, I believed life could never get any better, but then it did. One humid summer day, as my friends and I sweltered in the heat, playing kick ball on the steamy asphalt, we heard the rumblings of an engine. Bookmobile? What in the world was that? Once parked in the cul-de-sac, we climbed abroad the massive blue and white vehicle and I was among friends. Nancy Drew, The Hardy Boys, they’d all hitched a ride. Now in my fifties, I struggle to find quiet reading time. The day job, family responsibilities, the current WIP, writing blog posts, all try to rob me of my guilty pleasure…curling up with a great book. Thankfully, no matter how busy, I jump on my elliptical with my Kindle and escape reality, while improving my health. It’s a win-win. So tell me, do you have a favorite spot to read or a special reading ritual? Comment below before 3:00 p.m. EST tomorrow for your chance to win an autographed copy of Second Chance Romance, releasing on February 21st. The winner (US ONLY) will be announced Sunday, February 19th in the IR Sunday Edition. Hi Jill, hope work has been kind to you today:) I enjoyed hearing about your book memories; I loved the Golden Books, especially the Poky Little Puppy!! I was blessed- my dad’s cousin was our school librarian, so I got advance notice of awesome new books coming in. I love sitting in a beanbag in our lounge room reading, in winter with a cup of tea. I also have an odd habit of sitting underneath my kitchen bench on a step stool, reading while I wait for the water to boil, sauce to simmer…you get the idea!! Hi Wemble! It was a great day at work, thanks. Oh, the Poky Little Puppy…I loved that one too. How nice that you had the inside scoop on new books. A beanbag chair and a cup of tea, sounds wonderful. Aren’t beanbags the most comfortable? Thanks for sharing your reading rituals today. Enjoy your weekend! Hi Jill. Thanks for sharing how your love of books began. I wish I’d had a bookmobile in our neighbourhood when I was growing up. I didn’t see one until after my daughter was born. We did have the scholastic book club newsletter though, and we could order books from it. I remember loving Clifford, the big red dog and The Berenstain Bears. I always loved a trip to the library. It’s great to see you here, Laurie. I have such fond memories of the bookmobile. Oh, Clifford…I loved him too. I’ve seen your reading room and I’m so jealous. It’s really beautiful and so neat! Thank you for purchasing SECOND CHANCE ROMANCE, I hope you enjoy it. Have a great weekend and enjoy the beautiful weather that’s in our forecast. Happy Friday, Jill! Thanks for sharing your love of books and reading. My love of reading started in 5. Grade when I read the entire Boxcar Children series. In the summer weekly I received my Weekly Reader. After I began driving my weekly chore was to take my brother to the YMCA for his swimming lesson. Across the street was the Christian Book store and I used my allowance and my bakery money earnings to buy Christian romances. My FAVORITE RITUAL was: as a pastor’s wife with young children during the summer, I had a monthly reading day. My sons knew not to disturb mom. Lunch was in the refrigerator and unless you were bleeding to death – you did not disturb mom. I liked to read a book in a day. Now I read whenever and wherever I can – my books are on my phone, Kindle, and iPad. I prefer to read on my bed, so I can stretch out. In the summer I enjoy reading outside on my PaperWhite. During the week I read and reread children’s books to my 3 year old granddaughter, who reads to her dolls. Glad to have new reader in the family. Happy Friday to you too, Renate! Boy, it’s been a long week. Funny that you mentioned the Boxcar Children, I discovered them on the bookmobile. Wasn’t that a great series? “Lunch was in the refrigerator and unless you were bleeding to death – you did not disturb mom.” That’s hilarious! An entire day of reading…that sounds heavenly to me. It’s so nice to hear your granddaughter has learned the joy of reading at such a young age…thanks to her grandmother. I appreciate you sharing your rituals today. I hope you have a great weekend! I can totally relate to your love for books. I too was known to loose myself in a book for as long as I can remember. I remember taking books from the public library every summer and of course saving my pennies to buy books–my teen years were pretty much defined by reading Robin Jones Gunn’s Christy Miller’s series, in which pretty much my entire allowance would go. I loved book sales (still do) and that’s where I got pretty much all of my Agatha Christie collection (and lately all my nonfiction, academic related books). My favorite reading spot used to change during the year (mostly bed during winter, curled up with many blankets, and lying in a hammock in the summer), but these days I read just about anywhere. I had a feeling you’d relate, Priscila. Robin’s books weren’t around when I was a teen…you’re a lot younger than me. :) I did love Agatha Christie too. Ah…a hammock, that sounds so nice. With the new baby, I’m sure you have to be flexible when it comes to when and where you read. Congratulations to you and your husband! I appreciate you stopping by today. Enjoy the weekend. Thank you, Jill. We’re really happy with our baby boy. And you’re absolutely correct about being flexible to read now that he’s around. I thought I’d stop reading almost entirely, but it turned out that I’ve been just reading less frequently. Maybe I will stop as he reaches a more attention demanding age. Meanwhile, I’ve been getting really cool book suggestions from this blog. Thanks to you all. Perhaps when he begins to demand more attention, you can give audio books a try. We love having you here, Priscila! Enjoy your day! I am so excited and happy for you! Readers will love Second Chance Romance. I’m also a life-long reader. I remember how exciting it was to get my first library card. We had age restrictions and had to be able to write our name too. I also loved the summer reading programs and getting stickers for each book I read. I read every night before going to sleep, even if I’m exhausted and only get to read a couple of paragraphs. It’s part of who I am. This year I started listening to books on CD as I travel, and that’s been fun and it keeps me awake. Hi, Jill! I’m commenting, but please don’t enter me in the drawing. I want someone else to have a chance to win this wonderful book. Like you, I experienced the joy of reading at an early age. The Bookmobile would come by my neighborhood, giving us the chance to borrow great books. Among my favorite first books were Alice in Wonderland/Through the Looking Glass (Lewis Carroll) and Mitch and Amy (Beverly Cleary). My favorite place to curl up with a book is my bed! I have a wonderfully warm sherpa blanket and plump pillows. Sounds very comfortable, right? Too comfortable sometimes. I often fall asleep in the middle of reading! Hi L. Marie! Thank you for your sweet comment. I really appreciate your support and encouragement. I’m happy to hear you were able to enjoy visits from the bookmobile. I remember ours was always freezing, but it didn’t matter, I wanted to get some books. :) Oh yes, the Sherpa, along with plump pillows is a guaranteed snooze fest, no matter how good the book. Thanks for visiting today. I hope you have a fantastic weekend! Hi Pix! Thanks so much for popping over here today. Stuart Little was so sweet, wasn’t he? For some reason, I don’t remember the Velveteen Rabbit. I must Google it, and maybe it will jog my memory. Pooh has always been a favorite of mine too. So much wisdom inside that little guy.  Thank you for your kind comment about my book. You’ve always been a tremendous support and so encouraging. You’re entered! Have a wonderful weekend! I don’t remember the standard children’s book except for Winnie the Pooh but I went to a Catholic grade school and read every book in their small library. Unfortunately they were all biographies of saints along with their horrific and brutal deaths. I still can’t read Stephen King. Hi Kate! I appreciate you stopping by today. Winnie the Pooh was and is still loved by many. I hear you on Stephen King. While in college, I read so many of his books, but somewhere along the line, I turned into a big Scaredy-cat. Have a great weekend! Happy Friday, Jill! You know what that means? More time to READ! lol. I don’t know how you squeeze it all in, sweet friend. I’m on a bit of a reading hiatus right now, but when I do read, I’m curled up on the recliner in the evenings while hubby watches something on TV that doesn’t interest me. I really like your idea of reading on the elliptical. Total win! Oh, and please don’t enter me in the drawing. 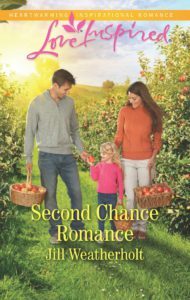 I was honored to read Second Chance Romance already (THANK YOU, JILL!). I’m so excited that your big day will soon be here and the whole world will have a chance to enjoy your baby. Wishing you an amazing weekend, my friend. Hugs! Ah, you bring back wonderful memories. I haven’t thought of Bookmobiles in ages. I wonder if they’re still out there. Hi Jacqui! I appreciate you hopping over today. The bookmobile is one of my favorite childhood memories. From what I’ve read, there’s still some rolling into neighbors across the US. That makes me happy. I hope you have a great weekend! Elkhart, Indiana or a community near there just purchased a book mobile in the last year! That’s great to hear, Renate! 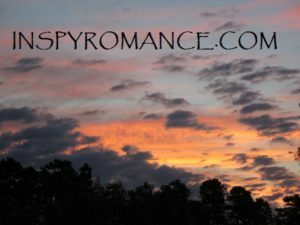 I always enjoy reading your blog posts, they always bring a smile to my face. I typically put my feet up on my desk and read a good technical manual or user guide. LOL Not a lot of reading in my life, although I do enjoy a good story and typically use Audiobooks in the car. So unless I can get you to read your book to me, I think I’m going to have to buy a copy and actually read it. Looking forward to it and congratulations again. Any chance there’s an Audiobook coming out too?! Thank you so much, John. It makes me happy that you enjoy my blog posts. Hey, there’s nothing like a good user guide, eh? LOL! I have a difficult time with Audiobooks as my mind tends to wander. As far as I know, my book won’t have an audio version, unless I record one myself with a handheld recorder, which is highly unlikely. :) I appreciate you stopping by today. Have a great weekend! Thank you for the walk down memory lane, especially seeing a Golden Book I loved with the little girl and the daisy circlet. There are a lot of winners here. I hope I’m The One! Hi Marian! Thanks so much for the extra clicks to make it here. There were so many great Golden Books but that was always my favorite…such a sweet little face. I hope you’re a winner too! Enjoy your weekend! Happy Friday, Jill. So nice to see you out and about. I was so pleased to see Stuart Little show up. Happy Weekend. Hi John! Thank you for the extra clicks. I appreciate your visit. Wasn’t Stuart Little the greatest? Happy Friday to you too. Enjoy the weekend! Thank you, Jill. You as well. In the winter the sun comes streaming through the glass storm door in the front of my house and I love to sit there in the sun with a cozy blanket and lunch and read for a while. We’re kindred spirits, Jessica. I do the same on our front staircase, while writing. Enjoy the warmth! Thanks so much for visiting today. Enjoy your weekend! No bookmobile where I grew up, but almost as good was the day my mother took me with her to the second hand bookshop she used to buy her Harlequins from! Books jammed every ankle in every corner – a wonderland! I also borrowed to the max allowed from the library, and spent all my pocket money (and when I was older, my babysitting earnings) on books. The one sad thing about writing is that it chews into my reading time! That bookshop sounds wonderful, Autumn. It’s definitely a space where I could spend hours. You’re not kidding about writing taking up our reading time. It’s certainly a juggling act. Thanks for sharing your memory today. Enjoy the weekend! That’s great that the big day for your book is almost here! I’m excited to read it. Your posts always bring back memories – I loved Judy Blume books, the Narnia ones, Harriet the Spy, Little House on the Prairie – there were always so many great ones to read! I used to climb out onto the roof to read them. Now I just read on the couch instead. Hope you have a happy weekend with lots of book release celebrations! Hi Sheila! Thanks so much for coming over today. Oh my gosh, how could I forget Harriet the Spy! I loved her and Little House on the Prairie. LOL! I guess reading on the couch is safer than going out on the roof. :) Did your parents know? Have a great weekend! Perhaps you’ll head out to the roof. :) Enjoy! Didn’t our parents always find out, Sheila…LOL! Happy Saturday! I appreciate your kind words and your support, Sylvia. It appears that I missed out on Biggles. I had to Google it and it sounds like something I’d love. Thank you for visiting today and sharing your favorite childhood authors. Enjoy your weekend! I like to read on the couch in front of the fireplace. Toss in some tea and dark chocolate, and it’s perfect! Hi Carrie! That sounds pretty nice to me…especially the dark chocolate. :) Thanks for popping over. Enjoy your weekend! Well, it looks like I missed the cut off time to enter, but wanted to say thanks for sharing here. In grade school, I remember getting pamphlets with books to order for reading. We just checked off the ones we wanted and had our parents write a check to buy the ones we wanted. Oh, how l loved getting those pamphlets with all those descriptions of so many fantasies. My favorite: The Velvet Room. I know what you mean about not having the time to read anymore. I so miss it. Oh no, you’re good, Lori. The contest ends tomorrow, the 18th, at 3:00 p.m. I’ll definitely throw your name into the hat. Oh my! I completely forgot about the pamphlets. How great was that…check off what we wanted and our parents stroke a check. Life was good! Thanks so much for visiting today. I hope you have a fantastic weekend! Jill, you sound a lot like me, wishing there was more time to read. You sparked lovely memories here, of library books and bookmobiles (I snuck in a mention of a bookmobile in my first book). Hi Jennifer! It’s so nice to see you. I love that you mentioned a bookmobile in your first book. So, I assume they rolled through your neighborhood as well. Weren’t they great? My plan for this weekend, once I get my word count in, is to fire up my Kindle and start reading Calmer Girls. I might do OT on the elliptical. :) Have a great weekend! I liked listening to books read by my parents as a child. I also enjoyed the idea of Winnie the Pooh being a stuffed animal owned by a girl named Robin. If you look at the little cloak he wears and his page boy haircut, you may "see" a girl, too. My Dad read each time using just Robin and used the pronouns of her and she. My younger brothers and I didn't l this until a cousin told us the "truth." You love books as much as I do.I started my journey early,I remember reading nearly 80 books in the second grade. Favorite places to read, over the years have been up in a tree, stretched out on a rock overlooking a pond, in cornered, everywhere. Right now I usually read curled up on my couch, but I always have a book wherever I go. Oh my word! Eighty books in the second grade! That’s impressive, Linda. So, how many do you read now, one hundred and eighty? I’m so jealous. Perhaps you and Sheila should start a book club, she likes to read on roofs, but she might like the tree. :) Yep, like you, I’ve always got a book with me too. Recently, after being stuck in a two hour traffic jam, I was thankful for my book. Thanks for sharing with us today. Enjoy your weekend. I have always loved books! I cannot have too many lol. Best place to read is curled up on the couch with my dog and cat close by. Would love to win an autographed copy of your book, Jill! Thanks for the chance. Hi Sally! What? Your favorite place to read isn’t in the middle of a snow storm…outside? LOL! Seriously, your reading place sounds very cozy. Your name is in the hat! Thanks for sharing today. Enjoy your weekend! Congrats on your big day! Some of my early favorites were Heidi and The Five Little Peppers and how They Grew! Thanks, Val! I’ve got to Google that book, but it sounds so you! Enjoy your weekend. I’m so excited for you Jill, you’d think I was the one with a book coming out, LOL! My favorite winter reading spot is in my recliner, but I’m looking into the elliptical as a better choice for double duty. Tomorrow it’s going to be 70° so I’ll be reading outside on the patio soaking up the sunshine. Congratulations on your wonderful Second Chance Romance, your on your way now girl! Aw…Tracey, thank you so much for your sweet comment. I really appreciate your support and enthusiasm. LOL! I know it’s cozy, but we’re going to get you out of that recliner. I’ll be checking in with you. :) Your forecast sounds similar to ours. I’ll be writing outside for sure! I hope you’re feeling better. Enjoy the weekend! Congrats! My very first book I bought with my allowance money from a bookstore was “Tick Tock of OZ”. I must have been around 2nd grade and it was a book both my parents took turns reading aloud to my baby bro and me! Favorite spot to read: all of the above…but one place I remember with fondness was sitting in the cottonwood tree in the empty lot next to my childhood home during my 4th grade summer reading a neighbor’s collection of original Nancy Drew books…tons and tons of ’em! Enjoy your book launch – you’ve earned it! How nice to see you here, Laura. I really appreciate it. What a sweet memory of your parents reading to you and your baby bro. That’s so nice. But reading in the cottonwood tree…wow! I love that. All this talk about Nancy Drew, it’s making me want to revisit those stories. Thank you for your encouragement, Laura. I hope you have a great weekend! So many happy memories from books! Loved the Golden Books, Dr. Seuss, Stuart Little, Nancy Drew. And a visit to the library, a bookmobile, or a bookstore was bliss! I don’t read as much fiction as I used to . . . but I still enjoy curling up with a good book when I have the time. Hey Nancy! Thanks for popping over. Yes, so many great memories. Our elementary school always had an annual book fair. There were table and tables of fabulous books…it was a dream come true. Enjoy your weekend! I’m a committed reader in the bath :) :) Sounds like a great read, Jill. Good luck with it! Hi Jo! Thanks for coming over. I really appreciate your support over the years. I’ve tried to read in the bath, but I’ve ruined too many books. I’m better on dry land. :) Happy Weekend! The Poky Little Puppy was my favorite Golden Book. I usually curl up on my side of the couch to read in the winter or under some shade by the pool in the summer. Which books are you looking forward to reading this summer? I have great memories of reading The Poky Little Puppy, Amanda. It sounds as though your set, no matter the season. :) Oh gosh, my Kindle is exploding with so many books, I’ll have to do a quick inventory. Thanks for stopping by!